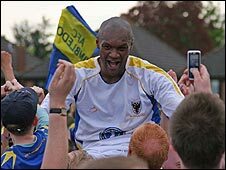 Former Wimbledon striker Marcus Gayle is determined to make his mark with Blue Square South club AFC Wimbledon after being named as reserve team boss. Gayle retired from playing at the end of last season after helping the Dons seal promotion in his final match. "I had no hesitation in accepting the offer as I know the club inside and out," the 37-year-old told BBC Sport. He played 285 games for the Dons and scored 47 goals in seven years after Joe Kinnear signed him from Brentford. 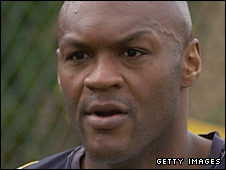 Gayle made over 650 league and cup appearances during his career with the Bees (two spells), Wimbledon, Rangers, Watford and Aldershot before joining AFC Wimbledon in the summer of 2007. He also earned 14 international caps for Jamaica. Gayle's first port of call after hanging up his boots in May was the familiar setting of Griffin Park, where he started his professional career. "I was at Brentford for four weeks of the pre-season period, helping out with the under-14 players and that was a great experience," added Gayle. But Gayle's progression into a permanent role arose suddenly and he hopes to pass on his considerable experience to his non-League charges. "The manager and the chairman gave me a call to see if I would be interested in the position and it was a quick decision for me, which I made overnight," he stated. "It is a position of great responsibility as I will train the lads and pick the team. I will take each step at a time." Gayle is keen to see the Kingsmeadow outfit continue its speedy rise up the football pyramid and feels there is a depth of emerging talent at the club. AFC Wimbledon are on a mission, having won the Ryman Premier Division play-offs last season. The club was founded in 2002 by fans of Wimbledon who were angry at the club's plans to move to Milton Keynes. The Dons were third in their first season in the Combined Counties League before winning the title 12 months later. AFC Wimbledon clinched promotion for a second successive season in 2005 when they were crowned Ryman League Division One champions. The club is now only one rung below the Blue Square Premier and Gayle hopes that he can nurture players who will help the club to continue to make progress. "Part of my job description is to bond with the youth team and bring them on so they can step up into the reserves," commented Gayle. "I have played with some of the boys in the reserves and I know what talent there is at the club. I'll try to pass on some of my knowledge to them." Despite having scaled the heights in his playing career, representing Jamaica in the 1998 World Cup finals, Gayle is acutely aware of his lack of coaching experience. However, the Hammersmith-born former Brentford trainee has a keen desire to learn his new craft at Kingsmeadow. Gayle revealed: "I am looking to take my Football Association coaching badge but need a few more sessions before I can go for it, I'm learning as I go." If Gayle's enthusiasm is matched by success, it is likely that AFC Wimbledon will reap the dividends.